My Parents are visiting me from India. Which translates to getting pampered and eating my way to all Goan specialties made by my mom. Like every Indian mom, my mom too feels I have lost weight and am not eating right. Its only when she lovingly cooks and overstuffs me that she feels truly satisfied. LOL. Since I don't get to see my parents very often I just cant have enough of their pampering. My parents originate from Goa which is a small costal state on the western peninsula of India. Goa is blessed with rows of coconut trees, spice gardens and a long coastline. Hence coconut, spices and seafood dominate the cuisine. Daily meals usually comprise of rice, fish curry, some vegetable and fried fish. Goans don't prefer an entire vegetarian diet but usually once a week an exception is made. Its for those special vegetarian day that recipes like Tonak, Uddamethi, Usal are reserved. Tonak roughly and hilariously translates to "something to bring taste to the mouth". Since its very hard for Goans to eat complete vegetarian meals, these spicy curries are made to make the meal more palatable. 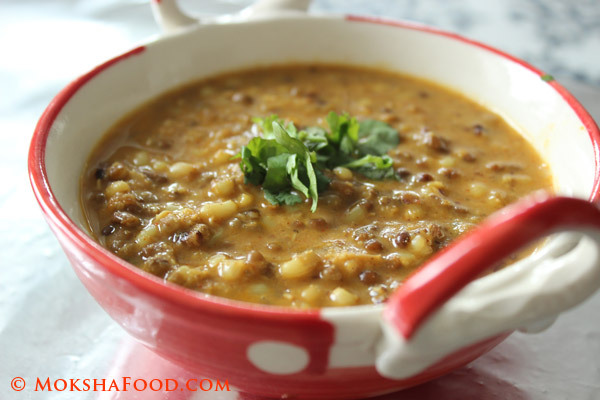 Today mom made Mutkiche Tonak which is a Moth bean curry. 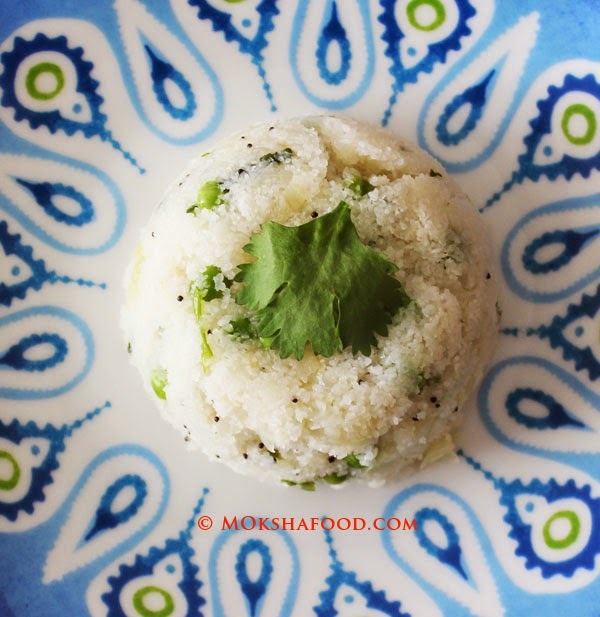 Tonak is prepared by grinding freshly grated coconut, red chillies and spices to form the base. 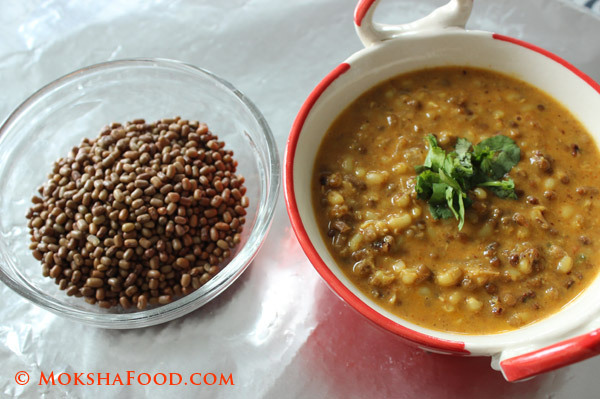 The moth beans can be alternatively replaced with sprouted moong, peas or mixed vegetables. Every home in India has its own version of garam masala, a medley of spices used to flavor meat and vegetables. Goa has its own variety which includes dried red chilies too. 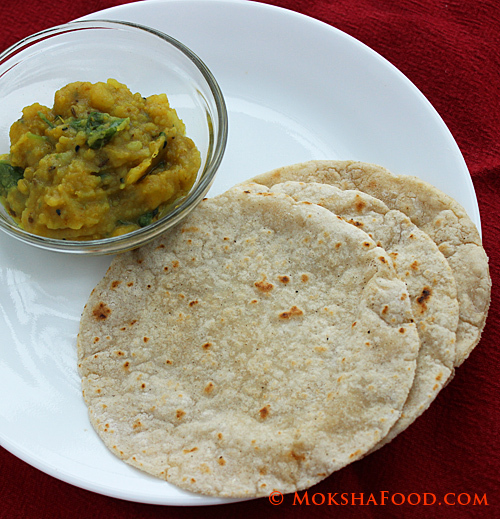 Residing in Mumbai, Maharastra for many years has put a strong influence on my mom's cooking style. She swears by the famous Bedekar's Sunday Masala. 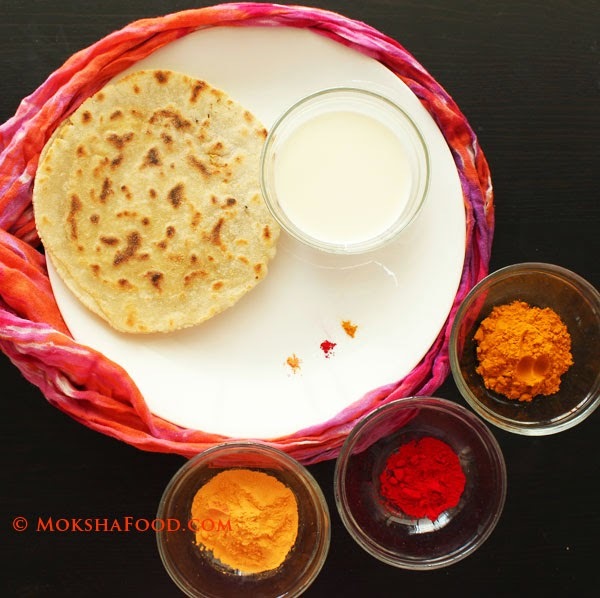 You can use whichever garam masala you have on hand. Heat a tbsp. of oil on medium heat in a large saucepan. Temper with cloves and peppercorns. Stir in the grated coconut and saute till colour changes. Add in the turmeric pdr, sunday masala and keep aside to cool. Grind this with little water to form a nice paste of medium consistency. In the same saucepan, add onions, tomatoes, potatoes and soaked moth beans. Add some water and let it cook till almost done. Add salt and the ground paste and let the curry simmer for 10 mins. Garnish with cilantro and serve hot with your favorite bread or rice dish.